Make stuffing for the turkey now and freeze ready to use on Christmas day. Make bacon-wrapped-chipolatas and put them in freezer bags ready to use when you need them. If you use a squeeze of lemon, lime or orange juice in a recipe, don’t throw the skins away – put them in a bag and freeze for grating at another time. Use in risottos, cakes etc. Lemon slices freeze well too, so you have them ready to add to cold drinks at any time. Try festive baked fruit instead. Cut fruit into chunks – apples, pears, plums, apricots, damsons – put them in an oven-proof dish with honey, a splash of orange juice, some dried fruit, a knob of butter and a dash of brandy. Then sprinkle with nutmeg, all spice or cinnamon, cover and bake for about 25 minutes. Eat straight away or cool it down and freeze for another day. Categories: Food waste | Tags: bacon-wrapped chipolatas, Christmas money saving recipes, Christmas turkey, Cranberry brownies, freezing food, freezing tips, ham and leek pie, LFHW, love food hate waste, Love Food Hate Waste Christmas tips, mini-Christmas cakes, money saving recipes, Oranges and Lemons, Turkey, Xmas food tips | Permalink. As part of this year’s Food Safety Week, Lewisham Council is reminding residents to store leftover food safely. New research published by the Food Standards Agency (FSA) on 11 June, shows that some people are taking more risks with food safety as they try to save money and make their food go further. Some people are ignoring ‘Use By’ dates more than they used to, while others are keeping leftovers for longer than the recommended limit of two days in the fridge. There are over a million cases of food poisoning in the UK each year, 20,000 hospitalisations and 500 deaths. Councillor Susan Wise, Cabinet Member for Customer Services, said: “Of course, we all want our money to go as far as possible and using leftovers is a really good way of doing this. But no-one want to be ill.
Bob Martin, a food safety expert at the FSA, said: “With most of us seeing our weekly shopping bills increase over the last few years, we are all looking for ways to get the most out of our shopping budget. If you are going to store leftovers in the fridge, cool them as quickly as possible, ideally within 90 minutes. Cover them, get them in the fridge and then eat them within two days. Make sure your fridge is operating at the correct temperature, it should be below 5oC. You can also freeze your leftovers, but cool them first to minimise temperature fluctuation in your freezer. They can be safely stored in the freezer almost indefinitely, but the quality will still deteriorate gradually with time, so it’s best to eat them within three months. Make sure you defrost frozen leftovers properly before using them. If you’re going to cook them straightaway use a microwave. If you don’t have a microwave, defrost them in the fridge overnight. Eat leftovers within 24 hours of defrosting and do not refreeze them again. The only exception to this is if you are defrosting raw food, such as meat or poultry, which can be refrozen once it has been cooked. Cook leftovers until steaming hot throughout. ‘Use by’ dates appear on foods that go off quickly. It can be dangerous to eat food past this date, even though it might look and smell fine. Check the ‘use by’ dates on the food in your fridge on a regular basis and be sure to use (eat, cook or freeze) food before its ‘use by’ to help you avoid throwing food away unnecessarily. 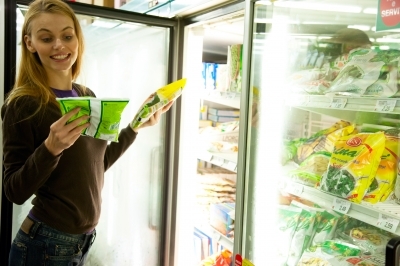 You can freeze food anytime up until the ‘use by’ date. Check the packaging to make sure it’s suitable for freezing. Once food with a ‘use by’ date has been opened, follow any storage instructions such as ‘eat within 3 days of opening’, but not if the ‘use by’ date is tomorrow. ‘Best before’ dates appear on food with a longer shelf life. They show how long the food will be at its best quality. Using food after the ‘best before’ doesn’t mean it will be unsafe. The exception to this is eggs, providing they are cooked thoroughly, they can be eaten a day or two after their ‘best before’ date. There are around a million cases of food poisoning every year in the UK. The levels soar during summer months across the UK with around 120,000 extra cases of illness from June to August. One of the reasons for this increase is warmer temperatures causing any germs present to grow faster, which underlines the importance of getting leftovers in the fridge quickly. Categories: composting, Food waste, Uncategorized | Tags: Best before dates, budget shopping, Cooking with leftovers, food safety team, Food Safety Week, Food Standards Agency, freezer, freezing food, FSA, leftovers, love food hate waste, meal planning, Use by dates | Permalink. There might have been a bit of a chill in the air but there were plenty of hot and spicy treats for the large crowds that gathered throughout the day for Lewisham’s first Love Food Hate Waste (LFHW) cooking demonstration. Richard cooks up a few treats for all the on lookers. On Monday 21st November, celebrated chef Richard Fox spent the day just outside the shopping centre near Lewisham market showing people how to make simple yet wholesome food from ingredients that they might on another day have considered throwing away. First up on the menu was a biryani accompanied by flat bread made from left over chicken, sausages, peas, green beans an onion, some rice, some flour and a few herbs and spices that are probably lurking in everyone’s cupboard somewhere. This was all cooked and dished up within 10 mins or so and served to show the shopping residents of Lewisham just what could be achieved using simple everyday ingredients. As well as showing people simple and easy to cook recipes, Richard was also giving out many tips on how to make food last longer and therefore increase its chance of being used up and of course not wasted (which is what the event was all about). For example, he demonstrated how to make coriander last at least a week longer by simply wrapping it in paper towel, sprinkling it with some water and then wrapping some cling film round the stalks. He also showed a plastic punnet filled with mushrooms that didn’t look their best and asked the crowd how many people would throw the mushrooms away with many agreeing that they would. Richard then cooked the mushrooms in some hot rapeseed oil before leaving them to cool. Once cool they could be put back into the fridge where they will keep for up to another 4 or 5 days and can be added to stews, curries etc. when required. This method was also demonstrated with some very overripe tomatoes which Richard explained were probably at their tastiest now and would be ideal for pasta sauces. 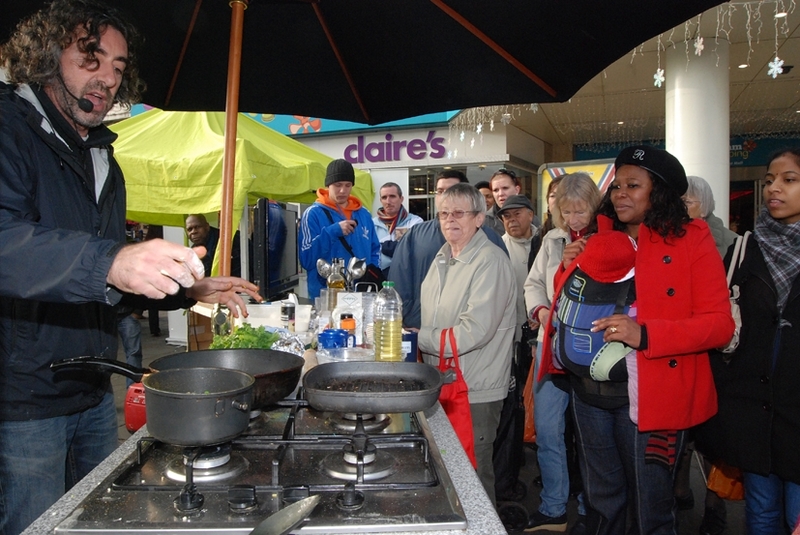 A second cooking demonstration is being planned for tomorrow (24th November) just outside the shopping centre again where chef Leigh Adams will be in action showing people how to make simple dishes and to think about not wasting food when there is really no need to. 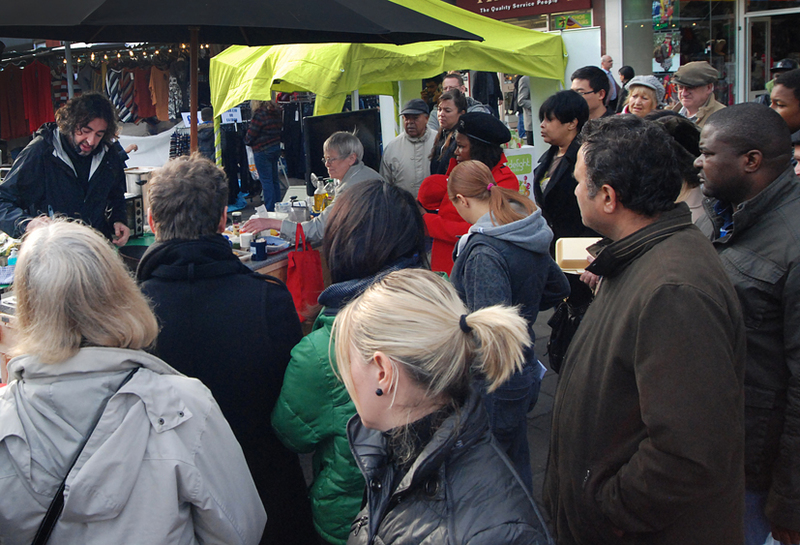 Categories: community engagement, Environmental Campaigns, Food waste, waste minimisation | Tags: Cooking demonstration, Cooking with leftovers, food bills, food packaging, food storage, food waste, freezing food, Leigh Adams, Lewisham Market, love food hate waste, Neil Morrisey, reducing bills, reducing food bills, Richard Fox, saving money, shopping habits, shopping in Lewisham High Street, shopping sensibly | Permalink.